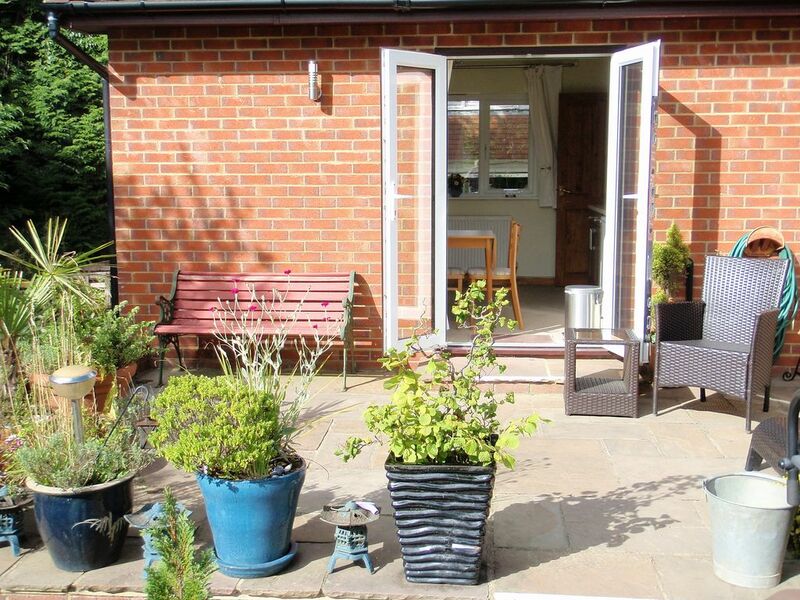 Self contained Annexe with double bedroom, shower, WC, kitchenette, lounge and south facing patio. Views across garden and paddock which is home to our various chickens. Close to "Downs Link" used by cyclists, horse riders and walkers. Not suitable for infirm, or children. Nearest railway station Horsham 15 minute drive. Not suitable for Pets or Children. No Smoking in accommodation. In easy reach of Brighton, Chichester, Guildford, Worthing and the South Downs. Local events include Goodwood Revival and Festival of Speed, National Trust Houses at Petworth & East Grinstead. Easy reach of Gatwick Airport which is 25 minutes drive away. Moved into property previously owned by father, good schools and rural location major factors in move. Secluded Location with Countryside Views, while close to Market Town and Sussex Coast. Free use of Hot Tub. Goring beach hut available for £20 per day. Shared Central Heating with main house, Electric Fire in Lounge. Two seater sofa, dining table with four chairs, coffee table, TV/DVD player, stereo radio/CD player with aux in socket. Plates, dishes, mugs and cutlery supplied along with basic cooking utensils. Combination microwave oven, fridge, double electric hob, toaster, kettle, sink, crockery, glasses, utensils and storage. Slinfold Golf and Country Club 2 miles away, 18 hole course, with driving range, swimming pool, gym, restaurant and bar. Notes on accommodation: Free use of Beachcomber hot tub. Outside: South facing patio with table and 2 chairs. Beachcomber Hot tub available. Utility Room: Boiler room with ironing board, iron and vacuum cleaner. Cleaning / Towels / Linen / Maid service: Towels & bedlinen provided, changed weekly. Other: Free Wi-Fi is available at this property and mobile phone network coverage is reasonable in this area for most networks. 2 x USB Mains Charging Sockets in Bedroom. Recently constructed beach hut at Goring by Sea available at extra charge of £20 per day. A very quiet and comfortable place to stay. Pauline & David are lovely people with a warm welcoming manner. Annex was great - had everything i needed for this business trip. Drive into and back from Horsham was okay each day. I'll be back. We were asked by David and Pauline what time we would be arriving because they wanted to be around when we arrived. As soon as we drove in the driveway we felt the stress fall away. A beautiful flat with everything you could wish for, a real home from home. it was so lovely sitting outside and enjoying the garden and peacefulness. Even the dogs and cats came to welcome us. David and Pauline could not do enough to make us feel at home. On our arrival we had lovely fresh eggs and cakes waiting for us. Thank you for a wonderful stay. Lovely and clean and tidy. Situated in a charming quiet village. Lovely view garden side of annex. Plenty of room for 2 people. Furniture comfortable. Hens and cockerels in owners garden which gave it a real country feel! Only downside for me was that I like to lay on the bed in the afternoon for a half hour nap, but at this time was aware of voices coming from main building to which the annexe is joined to. Did not hear this at night time which was good. Owners David and Pauline very kind and helpful. Ideal for get away with coast in easy reach. Hot tub for use but unfortunately we had rain so couldn’t use it. Garden would be lovely to sit outside. Everything you need. Owners friendly and helpful. Can walk into village but quite dark at night - need torch. 45 minute drive to Sussex coast, with sandy or pebble beaches. Gatwick airport 30 minutes drive, car essential. 15 minutes from Horsham, 20 minutes to Petworth, 30 minutes to Guildford, 45 minutes to Brighton. 10 minute walk to village shop/Post Office and pub with beer garden. 10 minute drive to Tesco Broadbridge Heath. 5 minute walk to "Downs Link" bridleway. 40 minutes drive from Goodwood House/Racecourse/Motor Racing Circuit. 30 minutes drive from Hickstead All England Show Jumping Course. 30 minutes drive from South of England Showground at Ardingly. 20 minute drive to Petworth House, 30 minute drive to Bluebell Steam Railway and Wakehurst Place. 15 minute drive to Wey & Arun Canal Trust. Changeover Day: Arrival on Saturday at 17:00 preferred. Departure by 10:00 Saturday preferred.